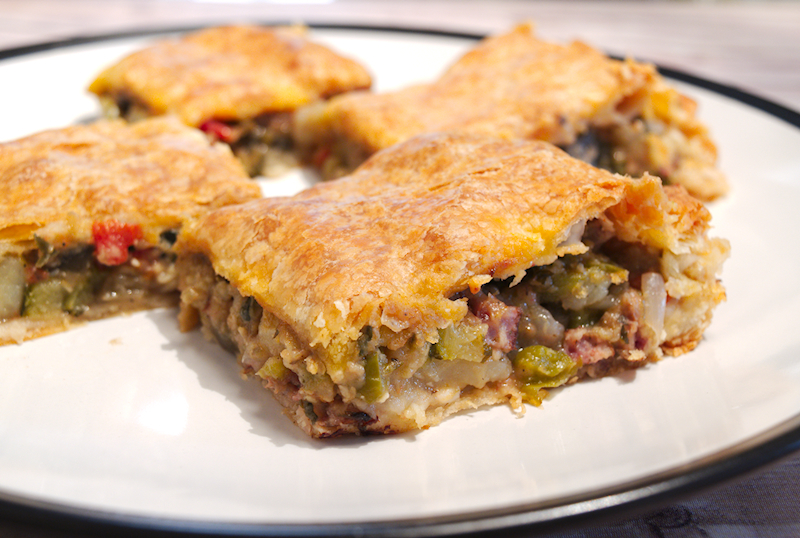 A simple but delicious smoked sausage and eggplant pie recipe. Tasty, crunchy and full of aromas! I was a naughty boy last week. No, nothing serious that needed the police to be alarmed or anything. The weather was nice and we decided to have a barbecue. Lamb chops, chicken wings, pork ribs, turkey burgers, Greek sausages…everything. It was such a feast but too much meat for my liking. In order to clear my sins away, I decided to make a vegetarian pie to keep me going. The guilt of eating lamb chops would go away with some eggplant and zucchini. It was a good plan. Until…I saw that I had some smoked sausage left in the fridge. Damn it! I had to use it. 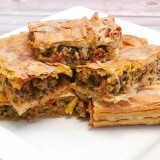 Buy-buy my vegetarian pie, hello my new smoked sausage and vegetables one. 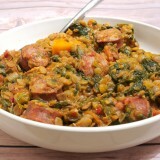 Smoked sausage doesn’t need to be cooked a lot, so it’s introduced at the end of the cooking process. I used some potatoes to give it a thicker substance. Potatoes need to be introduced in the beginning, as it takes more time for them to be cooked. This is another pie in my series of pies. I don’t think this one has a special name in the Greek cuisine, I would call it “Everything Goes Pie” as I literally put in there everything I had and could think of. 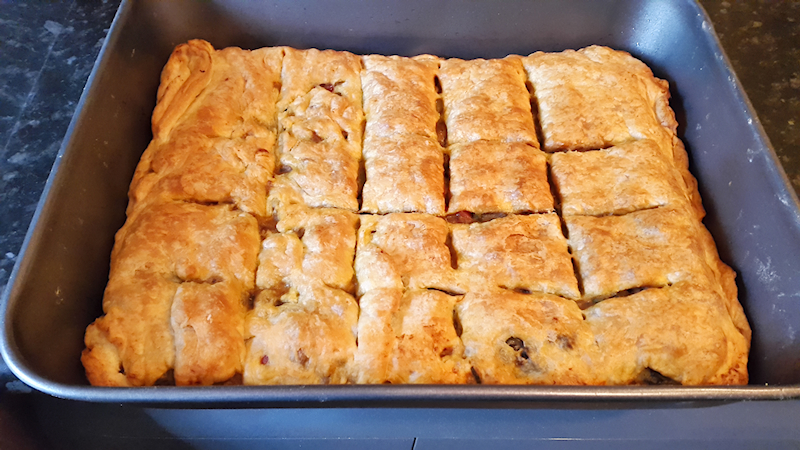 As a fast solution, I used puff pastry sheets that turn to be quite nice. If you can find a more interesting Filo pastry sheets, you can give it a try. 2 eggplants cut in cubes. 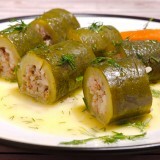 1 zucchini cut in cubes. 2 potatoes cut in cubes. 1 ½ onion coarsely chopped. 2 tomatoes cut in cubes. 200 gr (7 oz) smoked sausage cut in cubes. ½ cup of flat leaf parsley finely chopped. 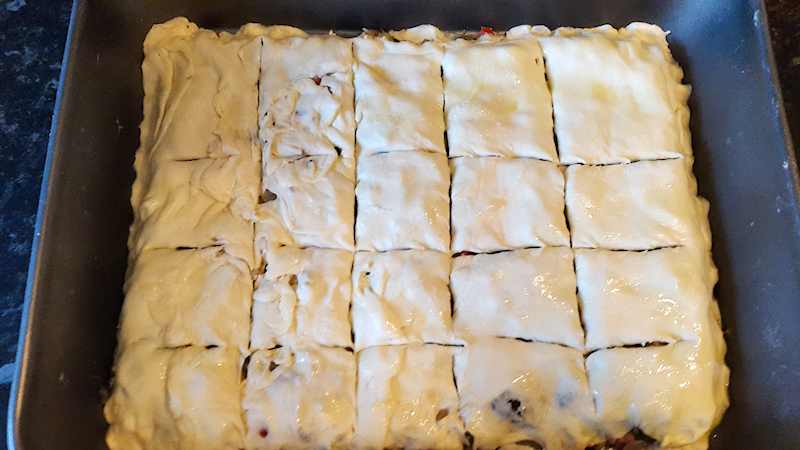 150 gr (5 oz) Feta cheese crumbled. Warm up the olive oil in a large and deep pot on medium-high heat. Add the potatoes and fry them until they start getting soft. 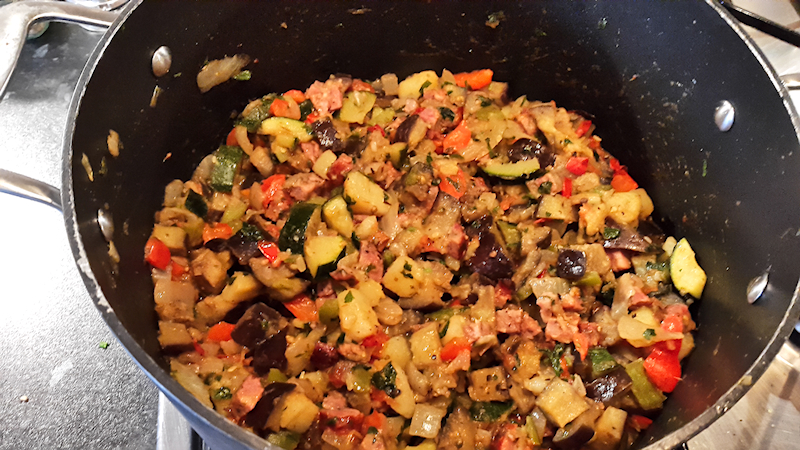 Add the eggplant, zucchini, peppers and onion. Add the oregano and season with salt and pepper. Lower the heat to medium. Cook them for ~ 10 minutes until soft while stirring occasionally. Add the tomatoes, the sausage and parsley. 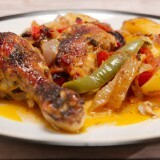 Give it a good stir and let it cook for another 10 minutes until most of the juices are absorbed. Remove from the heat, add the Feta and give it a good stir. Let it cool down for at least 30 minutes. It should be relatively cold when you lay it on top of the pastry. Use a medium-large tray and spread some olive oil on the bottom and side walls using a kitchen brush. Place one of the pastry sheets on the bottom, making sure it covers part of the walls. 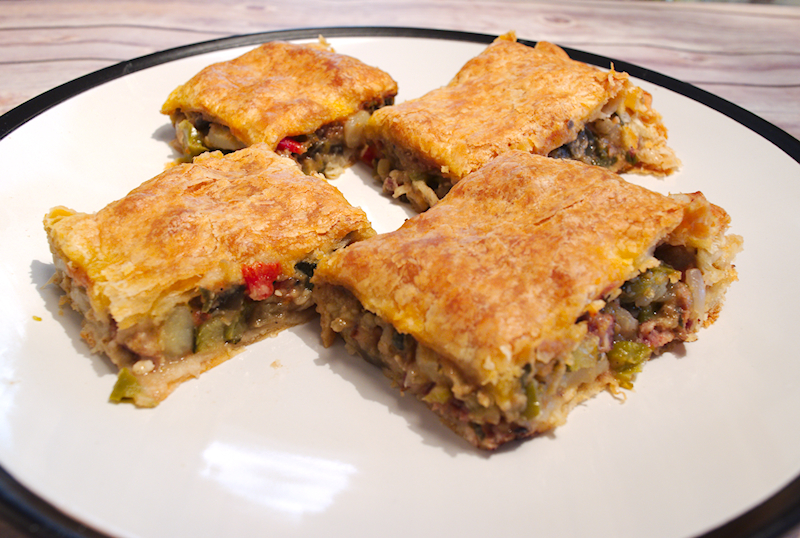 Add the eggplant and sausage mixture and add the second pastry sheet on the top. Fold the sheets nicely so the juices don't escape from the sides during cooking. Use your kitchen brush and spread some olive oil on the top. Cut the pie in squares making sure you don't reach the bottom with the knife. Bake the pie for ~ 40 minutes until golden brown. Make sure you let it rest in room temperature for ~ 20 minutes before you cut it.